Hi everybody! 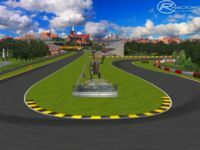 We can presented to you frist, polish track for rFactor named Krakowska Petla Zwyciestwa. This is effect our hard work and author idea. This track is very technical and exacting. Circuit contain real elements of Kracow city and meets the standards of Formula 1. On this track you can make free tests and races. To most interesting belong Wawel Dragon, which breathes fire and underground pit in/exit. There are currently no setups for Krakowska Petla Zwyciestwa. Add a Setup. I like the track.Outstanding quality.But the name and the file structure are really difficult. Why make the file structure so convoluted. ? Why make it a exe ? Why replace commonmas and tdf files. ? Fail , sorry you should do as 99% of other track builders do. Tested this as SP with AI active. It's a very nice track but there are 2 places on the track where AI gets out of control. One place when crossing the track below and the other place is on the start/finish line. AI wants to make a turn at those points? Seconding this. Basically whenever the AI crosses over the pits it thinks the road is the track and takes a turn. Really looking forward to running this. Looks terrific. Hopefully run multiplayer with some friends and test it out. Thanks!! Great track! I like fast corner and slow section. I like it! It's an exe file. Would rather have a zip file.